Some say the Sweet pomegranate is even sweeter than the Wonderful variety of pomegranate fruit. Regardless of your flavor preference however, pomegranate growers appreciate the Sweet variety because it ripens earlier than the Wonderful variety. The Sweet can be ripe and ready to harvest as early as the first week of September! This is ideal for growers because they can glean a longer harvest from this variety of fruit. The Sweet variety of pomegranate boasts quite possible the sweetest and juiciest fruit within the pomegranate fruit family. The fruit is one of the largest of the pomegranate varieties. 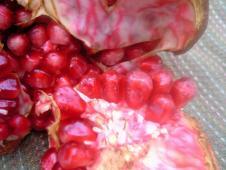 Instead of white flesh inside like other pomegranate fruits, the Sweet has a light pink membrane (flesh). Recipes abound featuring this pomegranate of Sweet variety. They’re delicious added to sweet potatoes, yogurt, and oatmeal, but there are many other ways to use them in every day cooking.The Sweet pomegranate tree can grow as tall as 12 feet high. The leaves of this ornamental tree are glossy and very pretty. The gorgeous orange-red blossoms in late spring make this a favorite decorative tree people across the country. The fruit is a healthy bonus in the fall! Healthy fruit (no splits) of this variety can be stored for up to two months in a cool, dry place. This variety of pomegranate was discovered in the 1940’s in the southern state of Georgia on the property of an old plantation. Someone (no one knows who) had taken buds from the original tree and grafted them onto seedling stock. The result was the Plantation Sweet variety of pomegranates. The fruit inside the Plantation variety has unmatched flavor and smells heavenly. The bright red pulp inside is so beautiful too! It is the most hardy when it comes to withstanding cold weather, which is a good thing considering it is the one variety that can be grown in the Northern states. You’ll likely see many homes decorated with this type of fruit during the latter months of the year in honor of Thanksgiving and Christmas. The health benefits of this amazing fruit have come to the forefront of the news in the last few years and now the “buzz” is everywhere. You can go to the market or your local grocery store and find pomegranate juice, fruit, seeds and many other products that contain the fruit. Imagine walking out your back door to pick your own! Sweet variety pomegranate and other varieties of this fruit grow pretty much on their own as long as you water them periodically and prune them when needed. They do require the sunniest area you have available, but can be planted in the ground or in containers. These pomegranates do well even in climates with “cooler” summer temperatures, so they’re ideal for growing not only in the South, but in the northern states as well. 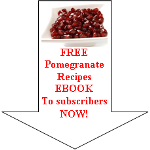 Read enough about the sweet pomegranate and want to discover more about this healthy fruit?